At temple Daigo-Ji 醍醐寺 in Shimo Fushimi, Kyoto. This festival is a type of the Ninnoo-e 仁王会（にんのうえ） ritual, performed at the temple Daigoji. It shows elements of the rituals for the five gread Fudo godai myo-o 五大明王. The godairiki deities are depicted in their wrathful form. 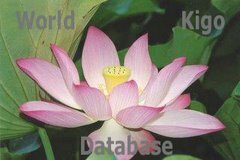 For more about the Godairiki Bosatsu, see the LINK below. It has a history of more than 1000 years. It is a prayer for the prosperity of the state and the wellbeing of its people, banmin buraku 万民豊楽（ぶらく）. The temple has been greatly revived by Toyotomi Hideyoshi, who held his last great cherry blossom viewing party with about 1300 people there. A procession re-enacting this event is held evey year. Now back to the big mochi rice cakes. People struggle to lift the heavy auspicious kagami-mochi rice cakes, one in white and one in red 紅白の鏡餅. The competition is called "mochi age riki hoonoo" 餅上げ力奉納.
. Temple Daigo-ji 醍醐寺 . Prior to "Godairiki-san" or Festival of the Five Powerful Deities, in which people measure their strength by lifting up "Kagami-mochi," or rice cakes, at Daigo-ji Temple in Fushimi Ward, Kyoto, huge rice cakes of the same size used in the power contest are being showcased from February 10 at two locations, including JR Kyoto Station plaza in Shimogyo Ward. 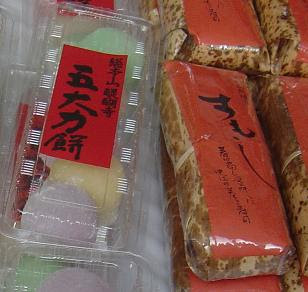 The temple started the rice cake display last year to publicize its annual memorial service held on February 23. 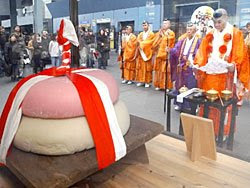 On the first day of display, red-and-white two-tiered Kagami-mochi, with a diameter of 80 centimeters and weighing 150 kilograms, were placed in the lobby of a hotel near the station, as well as in the station plaza. Standing before the Kagami-mochi, 13 Buddhist monks dressed as mountain priests blew conch-shell horns and read Buddhist sutras aloud in the ensoulment ceremony as they prayed for the happiness of local residents and tourists. Overwhelmed by the size of rice cakes, many tourists took pictures. The Kagami-mochi will be on display till February 23. The special talisman "Godairiki Mie, Mi-E みえ (御影)"
This amulet "with the shadow of the five great Bodhisattvas" has been worshiped for a long time, for it is propitious to prevent bad fotune such as robbery. These amulets are made powerful through the prayers of Buddhist priests for a week at the Dodaido-hall at Kami-Daigo. They are distributed only on Feburary 23rd. Nearby, the Godairiki udon 五大力うどん　are served, thick wheat noodles and a mochi on top. Decorated with seaweed and mushrooms. As a side dish you can eat gomadofu with sesame seeds and yubazushi, vegetarian sushi wrapped in yuba bean curd skin. 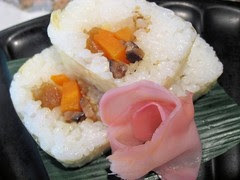 There is also a sushi dish called "sumoshi" すもし in memory of the famous Kasuga no Tsubone. 春日の局も賞味した湯葉の巻き寿司, Take no ko sumoshi 竹の子すもし（寿司）. She was the wetnurse of the third shogun of Edo, Iemitsu, and a rather determined woman. 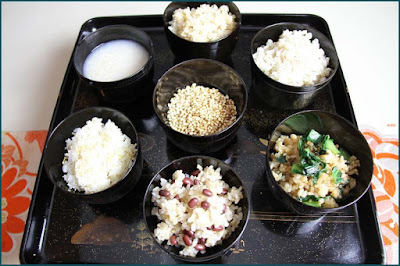 The dish has been re-enacted now, since it was named in old papers of the temple Sanbo-In 三宝院 in the precincts. This is a simple sushi: fresh bamboo sprouts are wrapped in yuba soy bean milk skin. Sometimes sushi rice is added nowadays. Gosan Ryori, gosan ryoori 醐山料理. It contains vegetables from the Daigosan mountain 醍醐山 and is prepared in a special way of this temple. The famous well water from the mountain is also used, daigosui 醍醐水. was from a prominent Japanese samurai family of the Azuchi–Momoyama and Edo periods. Born Saitō Fuku (斉藤福), she was a daughter of Saitō Toshimitsu (who was a retainer of Akechi Mitsuhide). Her mother's father was Inaba Yoshimichi. Married to Inaba Masanari, she had three sons, including Inaba Masakatsu, and an adopted son, Hotta Masatoshi. She was the wet nurse of the third Tokugawa shogun Iemitsu. She also established the Ōoku, the women's quarters, at Edo Castle.
. Tokugawa Iemitsu 徳川家光 . The wooden Junteido "Kannondo" hall and an adjacent rest house at Daigoji Temple in Fushimi Ward, Kyoto, were destroyed in a fire early Sunday, officials said. According to the temple, the fire broke out soon after lightning knocked out power at the temple at around 11 p.m. Saturday. The Yamashina Police Station suspects the cause of the fire may have been the lightning. According to the police, two monks staying near Junteido hall, where the statutes of Kannon were placed, spotted the fire at around midnight. Because the hall is located in a mountainous area, cell phones do not work there. They had to walk down to the nearest phone to call the authorities. The temple was hit by lightning July 28, and one of the pillars of its Chinese gate suffered some cracks. Daigoji Temple was registered on the list of UNESCO World Heritage sites in 1994. The main characters are Igami No Gonda and the geisha Koman.